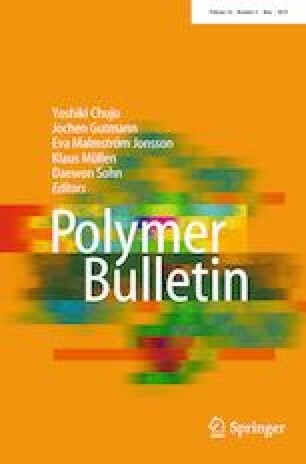 In this study, poly(l-lactic acid) (PLLA) modified using N,N′-adipic bis(benzoic acid) dihydrazide (BAAD) was fabricated by melt blending technology, and the differential scanning calorimetry, optical depolarizer, and thermogravimetric analysis (TGA) evaluated the effects of BAAD on crystallization behavior, melting behavior, and thermal stability of PLLA. Non-isothermal crystallization behavior indicated that BAAD as a heterogeneous nucleating agent had excellent acceleration effectiveness on the melt crystallization process of PLLA; however, an increase in cooling rate weakened the crystallization promoting effect of BAAD for PLLA, resulting from increasing cooling rate which led to decrease in the nuclei density. Additionally, non-isothermal crystallization results revealed that the effect of the final melting temperatures on the crystallization peak temperature and crystallization enthalpy was negligible. Isothermal crystallization measurement showed that the minimum t1/2 of the primary PLLA appeared at 120 °C, but the PLLA/2%BAAD exhibited the shortest t1/2 of 33.9 s at 95 °C comparing to the primary PLLA and other PLLA/BAAD samples. Through the analysis of the frontier molecular orbital energy and thermal stability of PLLA/BAAD system, it was proposed that the nucleation mechanism of the PLLA/BAAD system was chemical nucleation. Melting behavior of PLLA/BAAD system further confirmed the crystallization accelerating effect of BAAD for PLLA, as well as that the melting behavior of a given sample after non-isothermal crystallization was almost not dependent upon the heating rates, but the melting peak after isothermal crystallization shifted toward the higher temperature with the increase in crystallization time. Finally, the results of TGA measurements indicated that BAAD could not change the thermal decomposition profile of PLLA, but the concentration of BAAD could affect the onset decomposition temperature of PLLA. This work was supported by National Natural Science Foundation of China (Project Number 51403027), Foundation of Chongqing Municipal Science and Technology Commission (Project Numbers cstc2015jcyjBX0123 and cstc2017shmsA20021), Scientific and Technological Research Program of Chongqing Municipal Education Commission (Project Number KJ1601101), Innovation Team Project of Chongqing Municipal Education Commission (Project Number CXTDX201601037), and Natural Science Foundation Project of Yongchuan District (Project Numbers Ycstc and 2017nc4002).